It’s hard to believe we’re already wrapping up our third week out here at Eckley! Time flies when you’re having fun. We said goodbye to some old friends but made some new ones as well. Read on! On Monday we hosted visitors from Kutztown University’s Archaeological Field School! 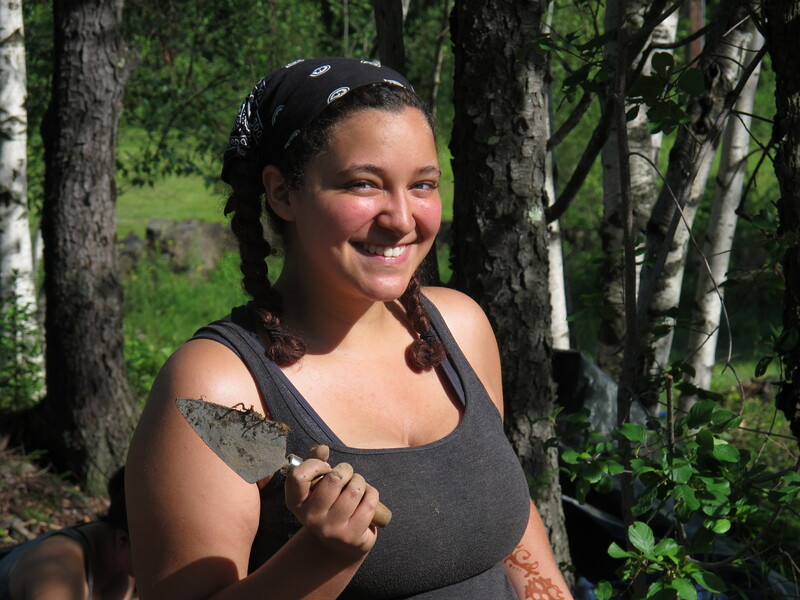 Dr. Khori Newlander is leading the group in their excavation of the former mill- and lumber-town of Stoddardsville, PA, located about 30 minutes from Eckley. Our fieldschool students had a chance to meet the Kutztown students and interpret what we’ve been finding to a small audience. The Kutztown students also got to see a bit of Eckley and understand what coal company town life was like before we said our goodbyes. 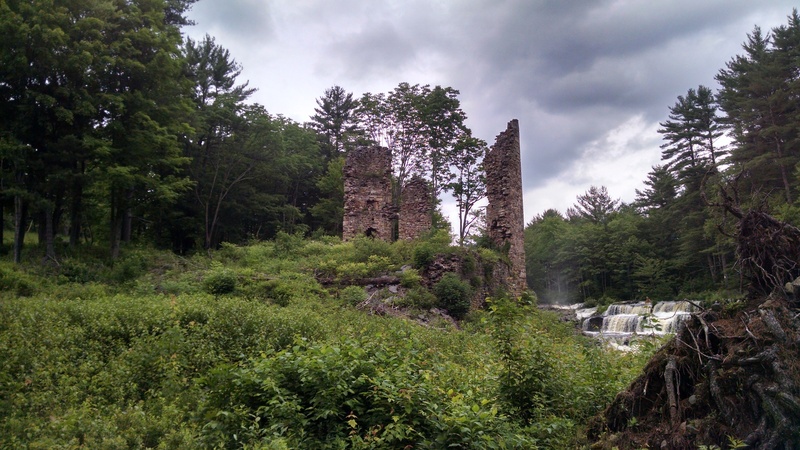 On Wednesday, Dr. Newlander and the Kutztown students were kind enough to exchange the favor, and we drove over to Blakeslee, PA, to see and learn about their site. Our students were extremely envious of the Kutztown students’ view (right above the Lehigh River in the shadow of a early 19th century grain mill – pictured below) and we learned a thing or two about making our excavation unit walls straight! We were extremely grateful to be able to spend some time with Dr. Newlander’s group and we hope to continue the relationship between the two field schools in future years. As for Eckley, we continue to be digging at breakneck speed! We’ve completed more in the first three weeks than we thought we’d be able to in the course of the entire summer. With this rapid pace, we’ve begun looking to new areas and house lots to dig. We plan on moving next door and beginning to shovel test the adjoining lot on Monday. Hopefully that house has as great materials and intact context as we’ve found at House Lot #38/40! The Back Street Girls lost one of their own this week. The girls said goodbye to Shannon, who, after three weeks of living, working, and experiencing Northeastern Pennsylvania alongside the crew, had to head back home. We are delighted to have met Shannon and hope to see her around these parts in the future. Goodbye, sweet Shannon! When one door closes, however, another opens. This upcoming week we will be joined by Aaron from Edinboro University of Pennsylvania and Megan Springate from the University of Maryland. Aaron will only be joining us through Patch Town Days, while Megan will be with us until the bitter end! I am excited to welcome these two new faces to the project and I can’t wait to report back on their experiences in Northeastern Pennsylvania! We are also happy to introduce Stephanie B.! Stephanie is a local who has decided to volunteer with us on her days off. Stephanie’s first day was Thursday and we look forward to seeing her Thursdays and Fridays for the rest of the project! Tuesday, Thursday, and Friday were a wash (literally) with rain on and off all day. Despite the inclement weather, however, the crew was able to pull through and open 4 new units this week: three just outside of the foundation on the sides of the house and one in the basement of the structure. We continue to find material culture from the mid-19th century through to the early 20th century. Our excavations are also helping us to understand how individuals shaped their physical surroundings through their modifications to the original house construction. While the artifacts can provide us with great information on the types of things people would have interacted with and used on a daily basis, architectural information can provide us with a different view into the minds and intentions of the first residents of Eckley. This week has seen a plethora of new and exciting artifacts! 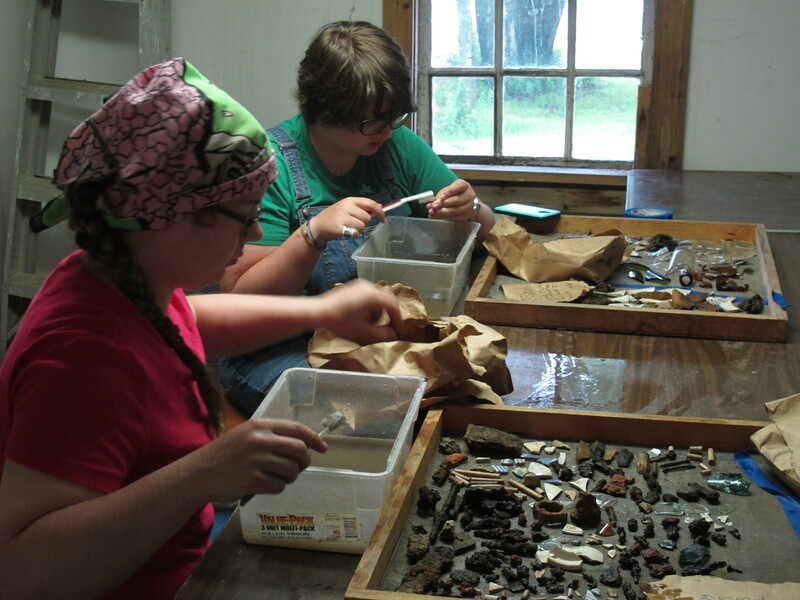 Glass bottle fragments with applied and tooled finishes have provided the students with an opportunity to try their hand at identifying and analyzing archaeological materials. While we aren’t finding as many of the handsome sponge and shell-edged decorated wares as we were finding in our earlier excavations, we continue to find cut nails dating to the 19th century, kaolin pipe fragments, and clay marbles! In two short days we will be meeting our high school volunteers! Last year we had an incredible group and I’m looking forward to having an equally-talented and motivated group this summer. Hopefully some of the students will be interested in writing blogposts about their first experiences in archaeology! If they do, you’ll be able to find those posts (and many more) at https://lattimerarchaeology.wordpress.com . Next weekend will be Eckley’s Patch Town Days Festival! For the first time, we will have active, open excavations at Patch Town Days and an opportunity for our field school students to really demonstrate what they’ve learned to the public! The full program for the weekend includes dance performances by the Ukranian Folk Ensemble and the Emerald Isles Step Dancers, music performances by The Troubles, the Irish Lads, Dave Matsinko, Henry Taminini, the Juggernaut String Band, and Paul Riffon, an art exhibition by Nicholas Bervinchak, a fashion show by Queen Victoria’s Court, and a tea party at the Sharpe House. We hope you’ll come out to support Eckley and these wonderful groups! And as always, we welcome interested volunteers any time! We are in the field Monday through Friday, 8am to 4pm. A privilege, and so fun!